The season of coming together with friends and family is fast approaching, and Thanksgiving will kick it off this week. With this, I think about the past year and what I am grateful for, as well as what I look forward to most in the New Year. Thanksgiving is an appropriate way to start the holiday season with a day of giving thanks for the harvest and reflecting on the preceding year. Everything with climate and the environment is related, and comes together in a complex system. This includes the little things, such as the food on your table during Thanksgiving, which is made possible by a strong harvest season due to the appropriate growing climate without draught or flooding. By making our energy system efficient, clean, and reliable, all sectors of the economy can thrive. The Northeast and Mid-Atlantic have made its mission to address climate change and reduce greenhouse gas emissions in order to mitigate further extreme weather conditions that may impact the things we are most grateful for. Throughout the course of 2017, there has been a lot of change – from a federal government that reversed our country’s commitment to climate change to states taking the lead and individually committing to uphold previous commitments. This makes me extremely grateful for the states across our region that see the importance of fighting climate change. In 2015, the international community came together to develop the Paris Agreement, whose central goal is to strengthen the global response to the threat of climate change by reducing greenhouse gas emissions, keeping global warming below two degrees Celsius above pre-industrial levels. The Paris Agreement entered into force on November 4 2016. The United States was part of this historic agreement, until the current administration announced the U.S. would withdraw. Yet, this has not stopped momentum and has encouraged states and cities to take the mantle. A total of 20 U.S. states, 110 U.S. cities, and more than 1,400 businesses have pledged to cut fossil-fuel emissions to ensure that the U.S. meets its commitment under the Paris Climate Agreement. This commitment is equal to $10.1 trillion dollars in support of the Paris Agreement and accounts for 2.7 Gt of emissions. 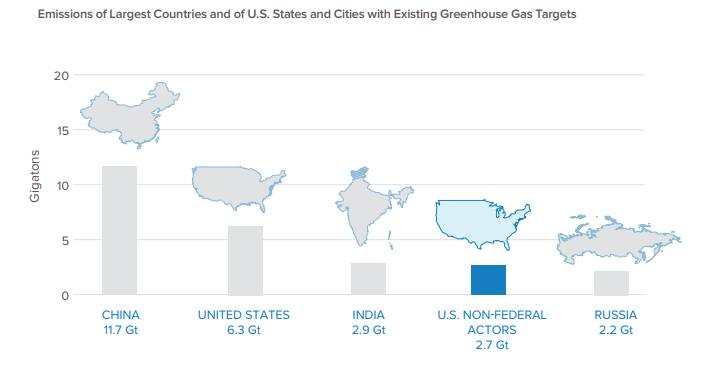 Connecticut, Delaware, Massachusetts, New York, Rhode Island, and Vermont have all committed to the United States Climate Alliance to reduce GHG emissions consistent with the goals of the Paris agreement. New Jersey passed legislation this year that urged the governor to join the U.S. Climate Alliance in addition to legislation that condemns President Trump’s decision to withdraw the U.S. from the Paris Accord. In Massachusetts, House Bill 3994 passed on November 1 and has been referred to the Senate Committee on Global Warming and Climate Change. This bill upholds Massachusetts’ commitment to the Paris Agreement. Regional collaboration and ambition will also help achieve the goals in the Paris Agreement. This administration has also suspended, and is attempting to undo, the Clean Power Plan (CPP), which was designed to cut GHG emissions from existing power sector sources by 32 percent by 2030. The nine states that participate in the Regional Greenhouse Gas Initiative (RGGI) has signed a bipartisan agreement to extend the RGGI program through 2030 and reduce the emissions cap by 30 percent from 2020 levels. The proposed changes would set a regional cap of 75,147,784 tons of carbon dioxide emissions in 2021 and then reduce that cap by about three percent per year. The states in this agreement include the states that have joined the U.S. Climate Alliance, as well as Maine, Maryland, and New Hampshire. In addition to these commitments by states throughout our region, the 23rd session of the Conference of the Parties (COP 23) took place in November 6-17 in Bonn, Germany. COP 23 is putting the framework in place by which real assessments can be made starting next year (at COP 24) for progress countries have made towards meeting the Intended Nationally Determined Contributions. The U.S. Climate Action Center provided a platform for members of Congress, governors, local government officials, NGOs, and a host of private sector players to shine a light on the scale of non-federal climate action taking place across the country. This Center popped up as an independent, unofficial venue developed right outside the COP gate during COP23, sponsored by #WeAreStillIn, #ClimateMayors, #TakethePledge and other non-governmental business and society groups. In conjunction with this, a report was released that serves as the first communication to the international community specifically addressing the scope and scale of state and local climate action taking place in the United States. So what can states do to uphold the Paris Agreement? Continued investment in advanced efficiency leadership throughout the NEEP region will help states not only achieve the goals set forth in the agreement, but also state-specific carbon reduction goals. Rhode Island has embraced advanced efficiency through the evaluation of the utility business model and role in achieving carbon reduction. The state kicked of its Power Sector Transformation Initiative this year with coordination between the state energy office, public utility commission, and stakeholders that is crucial in order to advance state energy planning to keep pace with energy system transformation. The Phase One report for the Power Sector Transformation Initiative has been released and includes recommendations presented to Governor Raimondo for action over the coming year to improve Rhode Island’s regulatory framework. Maryland’s Governor Hogan has announced a three year, $2 million grant for energy efficiency incentives for commercial manufacturers. The grant provides funding to the Regional Manufacturing Institute (RMI) for the purposes of identifying and assisting manufacturers in the Pepco and Delmarva service territories in need of energy efficiency upgrades to reduce energy expenditures. This grant will result in substantial energy savings for the commercial sector and help facilities install combined heat and power systems, which improve efficiency by 80 percent. States and cities have the opportunity to step up and work together to adopt and enforce ambitious building energy codes and appliance standards. These code reforms may be designed to optimize both new and existing building efficiency and environmental performance. This includes encouraging maximum electrification in order to phase out use of natural gas and fuel oil in buildings and appliances, and create water use reductions. Rhode Island is on a pathway to zero energy in buildings in 2035. States and cities can adopt building energy codes that go beyond the most recent energy codes and create finance mechanisms and funding models to incentivize deep retrofits or retro commissioning of existing buildings. There has been a lot of mobilization and ambition to uphold the United States’ commitment to the Paris Agreement and I am thankful for this. Looking into the New Year, I am encouraged and hopeful that states and cities will continue this movement and take action to implement more advanced efficiency policies and programs to help achieve carbon reduction throughout the region and beyond. As innovators in energy efficiency, the NEEP region has the opportunity to lead the way and become leaders in combating climate change.